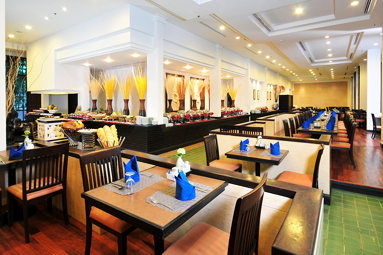 Anniversary or Honeymoon treatment for our customers. 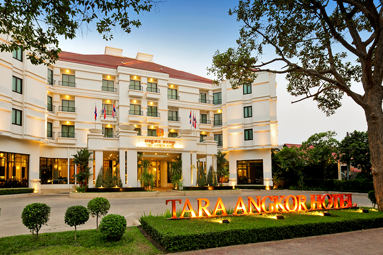 Tara Angkor Hotel is a 4-star, luxury hotel built in the mystical land of Angkor, ideally and conveniently located. 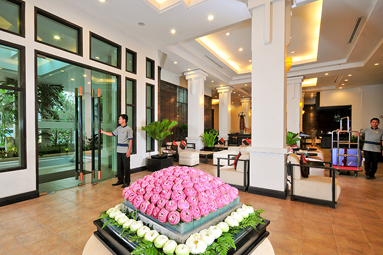 Tara Angkor Hotel is situated only 6 km from the World Heritage site of Angkor Wat Temple, a 15-minute drive from the Siem Reap International Airport, a few minutes stroll to the Angkor National Museum and a short ride to the city town center with an array of Cambodian souvenirs, shopping and culture. 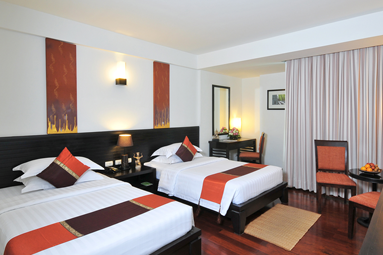 Our stylish 4-star property has cemented its status as one of the jewels in Siem Reap’s accommodation sector. Our facilities include 212 magnificent rooms and suites, two restaurants, a lobby bar, and a swimming pool with jacuzzi, fitness and a sauna. Further to this, we provide additional services and facilities designed to ensure your stay is both pleasurable and memorable.